Preheat oven to 400° F. Line a cookie sheet with parchment paper (do not use non-stick cookie sheet!). Slice tomatoes about 1/3” to 1/4” thick and place on sheet. Drizzle with 2 TBSP. olive oil and salt. Bake for approximately 45 minutes. Cool. 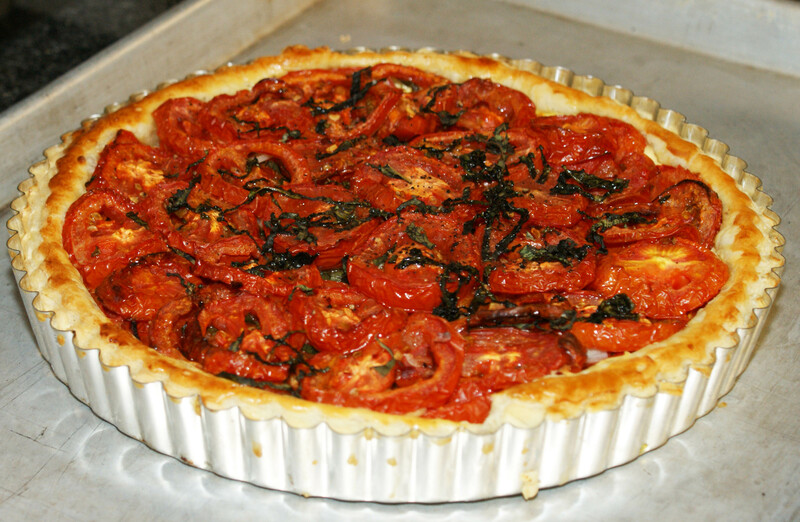 While tomatoes are cooling, place 1 sheet of dough onto lightly floured surface, brush with a little water and top with second layer and roll out until it’s a couple of inches larger than a 9” round, 3/4” deep tart pan. Press dough into pan making a slightly thicker crust on the edges and pierce all over with a fork. *(Save remaining dough scraps – see below). Spread dijon on dough and spread cheese on top. Place one layer of tomatoes on top, sprinkle with garlic slices and one half of the basil. Top with remaining tomato slices, basil, black pepper and pepper flakes. Drizzle on remaining olive oil. Brush outer edges of crust with egg wash. Bake for approximately 30 minutes. While pie is in the oven, mix ingredients for quick aioli. I like this version of the aioli because the freshness of the lemon is the immediate flavor-kick. Once pie is baked, let cool on rack, for 10-15 minutes as this is best served warm (not hot). Sprinkle with pinenuts, basil and olive oil. Slice pie and spoon 1 tsp. of aioli on each piece or on the side of the plate. Put the rest on the table for those who would like more. TIPS: This tastes like summer but it is quite rich so, I like to serve it with a simple salad. *Dough Scraps: I roll out leftover dough and throw in some parmesan, make bread stick twists out of these, bake with the tart and slice for perfect little croutons for your salad or for future use. For company I like this tart version with the chèvre. However this is excellent without the cheese, especially for us true tomato lovers.